Fig. 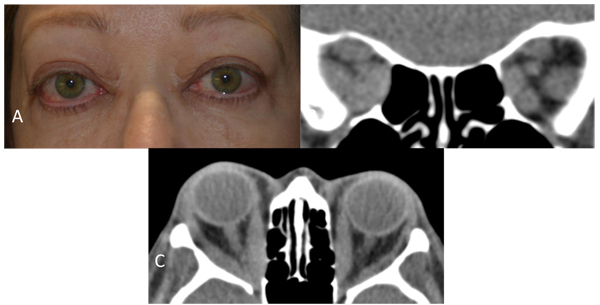 (1) A: Clinical photograph of a case with severe, active thyroid eye disease with exophthalmos, congestive orbitopathy, and compressive optic neuropathy. B: A Computed Tomography (CT) coronal section through the orbital apex shows enlargement of the extraocular muscles and compression of the optic nerve on the right side. C: A CT axial section demonstrates marked enlargement of the extraocular muscles with right optic nerve compression at the orbital apex.